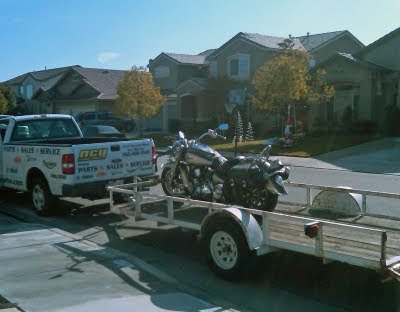 Today my Yamaha Road Star got it's first taste of being trailered. I had called North County Yamaha to come by and pick it up for me. It seems as if something wrong is with the starter motor. The battery is fine, the lights go on, the fuel pump goes on. Just an electrical "pop" when I hit the start button, and all goes dead. I'm not sure what caused this happen, it worked fine the last time I rode it, which was a long time ago! I just don't ride the Road Star much anymore. Yesterday I had tried to push-start it, but no go. I had pushed it up an incline at the end of my block, which was a lot of work. I only got about 80% of the way up there before running out of energy. I had to zig-zag it up there. I turned it around, put in neutral and coasted down. Then I kicked it into 2nd gear, but all it did was make the rear wheel skid. It just wouldn't turn over. So I called up North County Yamaha, the only metric shop within 50 miles that I trust enough to work on it. They're charging me $50.00 to trailer it to their shop, which is not that bad considering they're about 40 miles from my house. I know several people who own two or more motorcycles, and it's interesting to hear how they choose which motorcycle to ride. In most cases, it's a logical decision. If they're going on a long ride, they take the one that offers the most comfort and the most storage. If their going on an afternoon ride through the twisties, they take the lighter, more nimble bike. But other times I've heard people say that they're riding this bike because "it gets ignored", or because, "my wife likes the backseat on this one better". Sometimes it's a matter of fitting in. If they're riding with cruiser riders, they take the cruiser. If they're riding with sport bikes, they'll take what fits in best with that group. But in my case, it's whatever my heart says. When I walk into the garage, I check my heart to see what I truly feel like riding, either the Yamaha Road Star, or the Harley-Davidson Ultra Classic. For the past year it's always said, "the Ultra". It doesn't matter if I'm spending the day on the twisties, I still take that 900-pound beast. I think it's because I like all the buttons, dials, electronics, and compartments. That's the geeky side of me. Even though the Road Star is still the more fun bike of the two, it's still my penchance for bells and whistles that wins me over. The other thing is that I've wanted to master riding the Ultra Classic with it being so heavy and tall. I'm more confident riding the Road Star because it's lighter, has a lower seat height, and I can get my feet flat on the ground. But I can only get half my feet on the ground with the Ultra, and it's bulkiness makes me feel less confident riding it. Thus, I've opted to ride it more often hoping to master it. But all that has done is made me appreciate the Ultra for what it has to offer. Though, it's still a money-pit, costing me a lot in repairs and maintenance. Actually, if I didn't ride it so much, perhaps it wouldn't cost me so much. So, I need to get the Road Star fixed so that I can sell it off. The money will help me buy a different bike, hopefully one that I'll actually ride more often. Maybe if I can find a smaller, lighter bike that I'll ride a lot, I'll save money not having to repair the Ultra so often. But I don't know. My heart still says I'll end up riding the Ultra most of the time. Which is why I've talked about replacing it with a sport tourer. Bottom line is that I still can't seem to make a decision on this. I own a HD Ultra Classic and recently bought a Suzuki V-Strom 650. Two very different riding bikes. I do prefer the V-Strom for commuting and twisty riding. The Ultra Classic I like best for its cruise control, radio, storage and two up riding with the wife and long touring. I have not found the perfect combo in just one bike. This is why I love my Softail. It's sort of the "middle of the road," for me, a guy who can't afford two bikes. I have a bike that's fun to ride around town, but is also capable of touring with reasonable comfort. Since I ride to experience THE RIDE, I have no use for a radio. As much as I wish I had a fairing for practicality sometimes, it's just not the look I like, so a detachable windshield does the trick for me. I don't need a trunk either; two saddlebags does me fine 99% of the time. For a long haul I throw a T-Bag over my sissy bar. For me, it's the best of both worlds. If I had lots of money...I'd probably buy a Road Glide or an Ultra for the long trips. There's no doubt they are more comfortable than my Springer, even with her Mustang seat. I'd also buy a Screamin' Eagle Dyna for those times I want to tear it up with no need to haul any gear with me. I would never buy a sport bike though, even if I had the money. My back hurts just looking at the way these kids sit on those things. No thank you!